A subset of people on airplanes sometimes exhibit anxiety before takeoff; among the passengers is always one or two people that experience fear as the plane accelerates and shakes before it reaches the necessary air speed. This turbulence (normally) quickly gives way to a soothing increase in g-force as the aircraft rises and climbs to its target altitude. Eventually, the pilot signals to the crew and passengers that they are well on their way to their destination. This is where we are with XRP. We've seen amazing progress not only over the last few days, but over the entire first quarter of 2018. It seems like time slowed down in an effort to include more than was humanly possible for Ripple to accomplish in this time frame; in addition, it appears that xRapid adoption is picking up pace - especially among the worlds' top remittance processors. It was accurate to characterize Ripple as fighting an uphill battle until this point but from what I'm seeing recently, the market is now clearly signalling its preference for the new entrant in payments - Ripple and its preferred digital asset, XRP. While banks have been lining up to sign onto RippleNet and use xCurrent, the remittance processors have all been more aggressive, choosing to pilot xRapid for lowering their costs of liquidity. Banks are more conservative but as the cost savings continue to be documented at a low level of detail, and the worlds' nations provide more regulatory guidance for individuals and businesses that want to use digital assets, they will start to switch over to xRapid for liquidity. Limited insight is offered by Ripple's public-facing collateral in terms of the low-level implementation details of some of their software packages. This is most likely a result of flexibility in the type of configuration that the customer desires - in other words, customization. We understand this aspect of running a business - and the tough decision about how much detail to share publicly. I understand and sympathize with any business that desires not to reveal any competitive advantage, while also making an effort to function as openly as possible. The only down side to this is that the community often-times is left to speculate about how some of the software integrates with banking systems at a low level of detail. 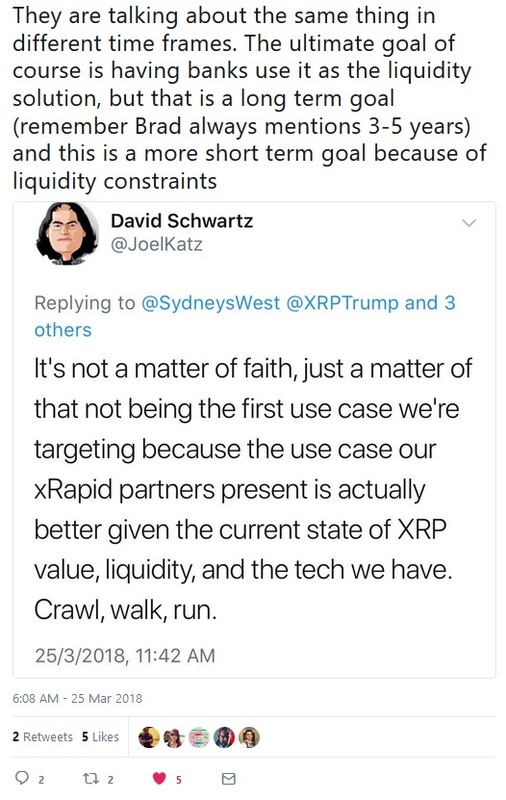 Because of this limited insight, we're left with some questions about the business part of XRP and xRapid adoption; what is Ripple's strategy when it comes to marketing their xRapid product? 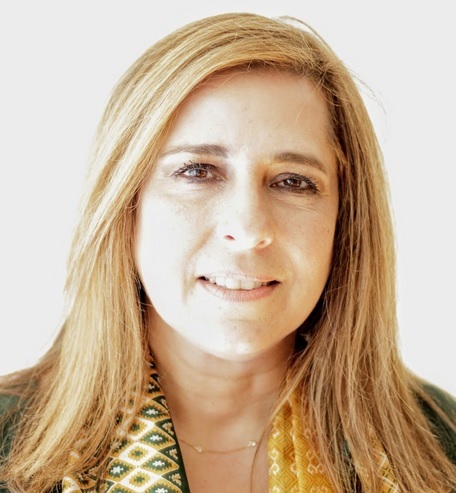 While some clues can be found from the recent signing of enormous remittance processors, it's the small clues that may reveal interesting aspects about Ripple's overall vision for marketing xRapid. While the crypto markets may react negatively to any business strategy that doesn't involve a massive price increase immediately, Ripple is focused on its multi-year goal of xRapid adoption that will promise sustained, utility-driven demand for XRP for years to come. Travelex is a large foreign exchange company headquartered in London; it handles international payments on a large scale. And on Wednesday they announced that they were hosting a meeting of banking professionals to discuss the latest open banking laws that were passed in Europe, along with the analysis of the first stage of implementing those laws. The panel is scheduled for Wednesday, March 28th at the National Theater in London. It's a 36-page paper that describes the opportunities and risks around virtual currencies and the underlying distributed ledger technology (DLT). 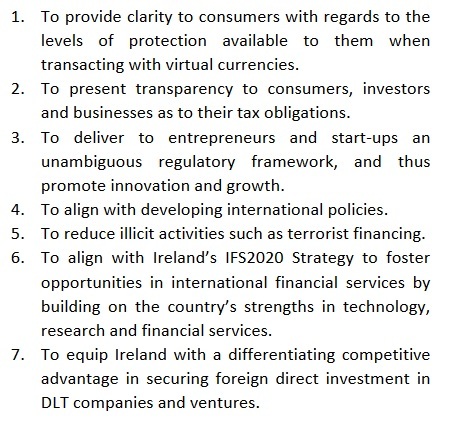 It's a well-thought-out analysis, and it's clear that Ireland sees virtual currencies as a trend that is not going away; congratulations to them for creating this document along with a list of tangible benefits that will be realized with effective legislation and regulation. It's obvious from the high-profile announcements recently on mainstream media and social media that the remittance processors are the first category of businesses that will be using xRapid - and XRP - to reduce their processing costs. Will this give them a competitive advantage over other companies - and banks - that are continuing to use the legacy SWIFT messaging platform? Absolutely. This seeking out of lower processing costs by many of the major remittance processing brands is leading to one inescapable conclusion: remittance processors are 'going first' when it comes to using a digital asset to lower the cost of international transfer of value. If this is the case, then we need to look at the remittance market itself - who are the new players and innovators? How big is the market? 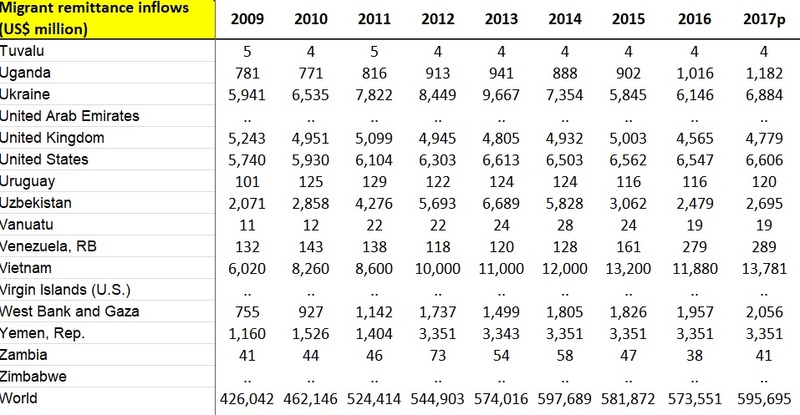 Some of these questions can be answered by looking at the official statistics that have been painstakingly gathered and organized by the World Bank. The worldwide trend is clearly increasing, but keep in mind that not all countries have massive remittance markets. Instead, the bigger numbers belong to just a handful of nations - typically nations where there's been a drain of working-age individuals as they migrate to other countries seeking out employment, better opportunities, or to escape conflict in a home country. "The global average cost of sending remittances has remained nearly stagnant, at 7.2 percent in 2017 Q3, significantly higher than the SDG target of 3 percent (World Bank 2017b)." The pattern is evident; the remittance market is growing, and many companies want to step in and capitalize on this trend by offering services that assist individuals with sending money home to their family members. To meet the World Bank's goal of cost reduction for these transfers, however, remittance processors worldwide need to switch their technology back-end to Ripple. We know that remittance businesses have already discovered the ability for xRapid and XRP to lower their costs; somebody needs to tap the World Bank on the shoulder regarding the potential of Distributed Ledger Technology to help them achieve their goals. SWIFT issued a summary of the results from its blockchain proof of concept. From this document, we learned a few things about the POC itself, which pointed to perhaps why the experiment resulted in the negative findings by SWIFT: It did not include the replacement of Nostro accounts by a digital asset. Unlike xRapid, SWIFT's solution was to merely 'pave the cow path' and hook up Nostro accounts into a permissioned blockchain - one that they built from Hyperledger. The concept was pretty simple: all of SWIFT's existing approach for transferring money would still be used, but the 'proof-of-concept' Hyperledger permissioned blockchain would be used to receive and send information from one party / account to another. In addition, the entire Nostro/Vostro framework of accounts was represented in the permissioned network. “The DLT sandbox enabled us to control access, to define and enforce user privileges, to physically segregate confidential data and store it only with the relevant parties while supporting a strong identity framework by linking all participants to their BIC, and having all keys signed by a SWIFT certification authority”. Reading this paragraph, I reached one conclusion almost instantly; SWIFT is not talking about a blockchain; they're talking about a centralized database. After all, what is a permissioned blockchain where one organization is completely in charge of all access? This is not a trust-less approach whatsoever - this is centralized architecture masquerading as decentralized technology. Conducting this POC is not a bad move for SWIFT if they can somehow convince the gullible to continue trusting the organization that takes days to move money across a border. In the meantime, I have the feeling that the worlds' banks are smarter than that, and it's becoming clear that the banking industry needs a solution that is something more than just window dressing - they need a solution that moves the entire global payments architecture from days to real-time. They need a solution that doesn't constrain itself with the legacy model of money transmission. My take on SWIFT's latest public-facing communication? More of the same. Regardless of if Yahoo owns part of the exchange or not, listing XRP on one more exchange would be a positive item. While I welcome a new exchange in Japan, BitARG has yet to list the individual cryptocurrencies that it plans on supporting. I'll take a wait-and-see approach, but keep in mind that some of these new exchanges will create surveys on Twitter or other forums to gauge user interest in different crypto choices. If this occurs, I predict that the XRP Army will show up to make its voice heard. Huobi, one of the largest digital currency exchanges in China, is planning on entering the US market. The company recently announced plans to open an office in San Francisco,12 and now two months later has registered with the Financial Crimes Enforcement Network (FINCEN) as a money transmitter business. "...confirmed the plan for a May launch through a WeChat announcement, anticipating a new crypto-only exchange platform specifically for U.S. investors..."
While XRP remains a top choice among Western investors, having a new platform that promises to be as big as Huobi is in China is a very exciting prospect. Custody Solutions - a Phrase Meaning More than "Wallet"
"In Q1, we’ll begin work towards the launch of institutional hedging instruments and custody solutions. Both of these market components are important to institutional adoption and thus are important components of our 2018 roadmap." This is one of those times when the phrase 'custody solutions' came into play. When I first read it, I thought of how banks don't want to be in charge of managing multiple crypto wallets and secret keys - their infrastructure would need to change to include this capability. So in response, I think Ripple is looking at either partnering with third parties to address this concern, or is offloading this particular task entirely to other companies. Either way, it indicates that managing the private keys and other sensitive information associated with digital assets is something that is now on the front burner. "Looking forward, the XRP ledger needs to be able to scale to serve 7.5+ billion people and even more devices. The current account mechanism likely doesn't scale to this level. Therefore, only those accounts that are most needed should be created. The reserve provides a barrier to entry for unneeded accounts. A new account mechanism that should allow the XRP ledger to efficiently service humanity scale usage is in development. This would allow everyone to have an account on the XRP ledger for low cost while providing the necessary performance for humanity level service." "As a Senior Backend Engineer at PolySign you will help architect and build the business logic and backbone services for the PolySign cryptocurrency platform. You will build central services such as the account, firm, and vault managers that form the backbone of our system, and connect them to the PolySign front end systems which include web and mobile platforms." While it may seem odd that we're looking at job descriptions for clues, information about new Silicon Valley startups tends to be minimal at best. Polysign may have wider-ranging goals than just supporting XRP, but I have a feeling that banks and other institutions will feel a bit more at-ease with using a digital asset if they can use a third party solution like what Polysign is developing. It's my hope that an exchange or provider like Polysign ends up creating an 'off-chain' wallet solution for XRP that somehow doesn't involve having to trust a third party with custody of your XRP. What does this look like from a technical perspective? For an answer to this question, I'll defer to others on the forums that may be experts in how cryptographic networks can interact with off-chain systems. One of the most exciting occurrences in community-driven XRP development took place recently. 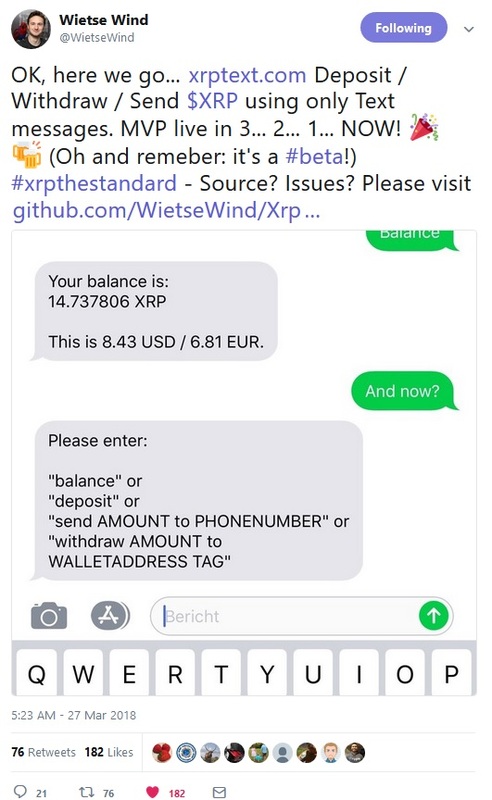 A talented community developer, @Wietsewind (Twitter handle), recently completed the beta version of his application that enables people to text XRP from one mobile platform to another. As if all this wasn't enough, he's continued to create new innovations on the XRP Ledger, including an application that supports users being able to send XRP from one mobile platform to another - using SMS texting! For those of you that don't already know about Cobalt; it's the name that's been assigned to a series of recommendations for changing and improving the Ripple Protocol. The location of the current public-facing version of these recommendations can be found here. It turns out Cobalt does much more than that; it also makes the XRP Ledger faster - much faster. One of the researchers working for Ripple is Ethan MacBrough, the same author that wrote about Cobalt. Recently, he's been communicating to the XRP fan base about some of these recommended changes. Upgraded ledger close times (this is the XRP equivalent to 'block time'): 1 second To arrive at this, it implies/assumes half a second for the consensus algorithm. 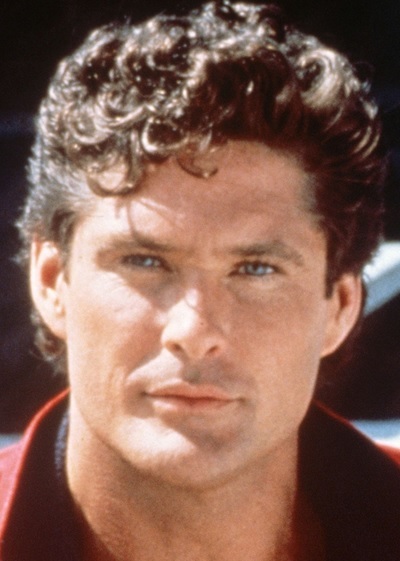 Transactions Per Second (TPS): Unclear, but in one tweet, Ethan indicates that TPS may be a "very high number" or even be scalable upwards "arbitrarily." While the native XRP Ledger performance metrics already dwarf other competitors in the crypto space, knowing that Cobalt will future-proof the XRP Ledger continues to provide more compelling reasons for banks and other financial institutions to invest in Ripple technology. The market has not understood what XRP represents, or that utility-driven demand is imminent. We are dramatically undervalued at the moment, and it's because of the inability of many investors to understand the difference between crypto hype and real business progress. Ironically, part of this has to do with how orderly things appear when Ripple is leading the charge. When people are flying in a jet airplane at thirty thousand feet, they don't feel the wind rushing by at five hundred miles per hour. Everything seems calm, quiet, and controlled. Likewise, Ripple makes it look easy. We see them attending conferences, presenting topics in videos, holding AMA sessions on Quora, and meeting with fans during various meetups. From where we're sitting, things look serene and efficient. 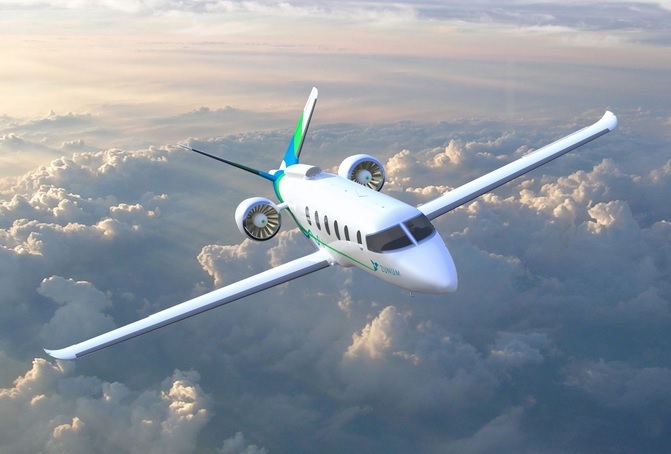 What we're not seeing is the power of the jet engines propelling all of us forward. Ripple is working diligently, continuing to build on its momentum. Because of this, we are all being accelerated into the future where massive numbers of banks, financial institutions, and others want to sign onto using Ripple technology. When a company enters a period of ultra-fast-growth, it's tough for it to keep up with demands and still keep laser-focused on its central use cases. Luckily for Ripple - and those of us that own XRP - the CEO leading the effort is one of the central proponents of businesses keeping their focus on core strengths. It's this strategy that has carried the day for Ripple, and has helped them establish the reputation of Ripple as the next big thing in global payments. Attention to details. It can make or break the best of us – even the most high-performing individuals. Getting the little things right is what sets apart planners and tacticians from the mundane personalities.